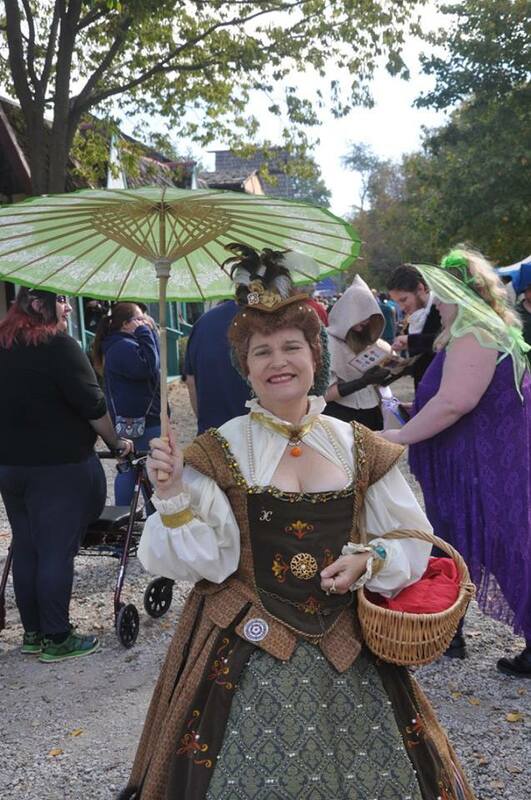 Last year I made an Elizabethan noble dress to wear while performing at renaissance festivals that was an utter train wreck. It was my first machine embroidery project, the fit of the bodice was off, and in an attempt to glam it up I think my dress looks more like a costume than my goal of period clothing. No one said anything to me one way or the other about the issues I have with this dress. I would never, ever point out any of these issues on a patron or fellow performer’s clothing Many of these things bug me and me alone and I admit I’m shallow enough to let it affect my performance. 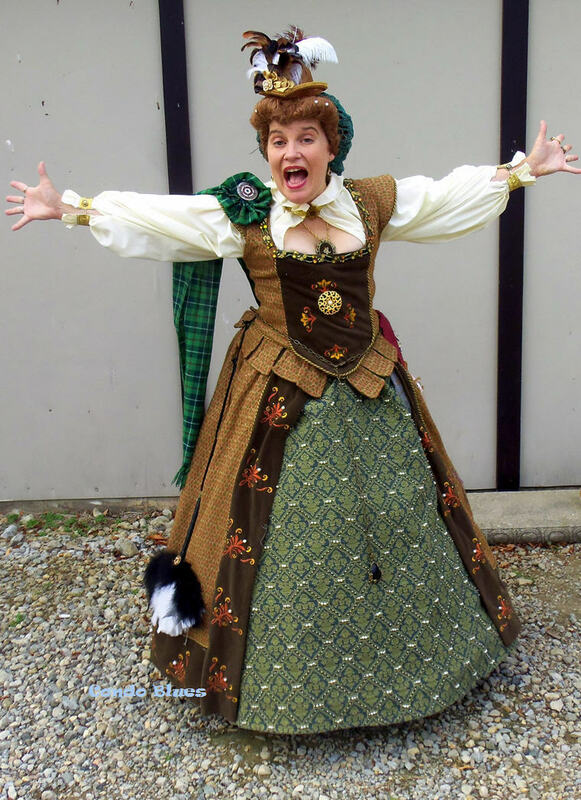 You could say the Tudors are the originals when it comes to clothing capsule collections because most of their clothing either tied or pinned together so they could mix and match sleeves, foreparts, bodices, stomachers etc. 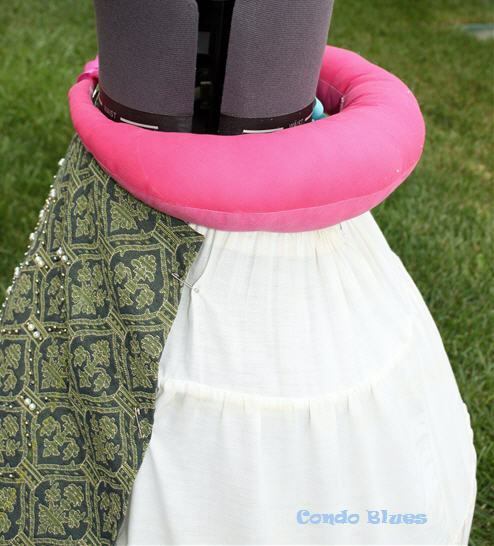 My costuming focus this summer was making my husband a new embroidered Tudor doublet, breeches, and hat. In the interest of time, I remade and made over the items that didn’t work and kept or tweaked the pieces that do. 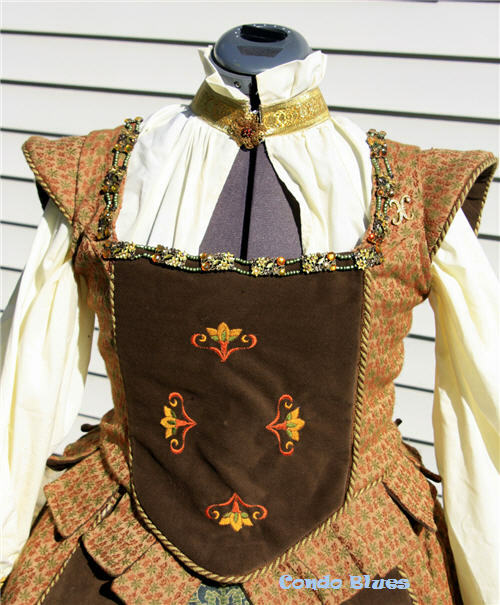 You can learn more about how to make a men's Elizabethan doublet and breeches here. The green gems on the trim look too fake. I’m not thrilled with the gold trim on the seams either. The shirt looks a little lumpy because I didn't put a petticoat over the hoop skirt (farthingale) for these work in progress photos. My bad. It looks sloppy like an unmade bed! The old version. Ye Olde Safety Pins stand in for the traditional ties to attach the forepart to the dress. I fixed the other fit issued by making a smaller bum roll (hip pad) using an real pattern from Simplicity Pattern 3782 Elizabethan Costume Dresses and couldn’t believe the different size and firt from the pad I had been wearing that I made from a too large hand drafted pattern since commercial patterns weren’t widely available at the time. Hacking my go to Elizabethan bodice pattern to make a side lacing bodice (which IS period) so I can dress myself did not work at all. The fit is off, especially in the shoulders. The split cap sleeves make me look like a linebacker. Not only did the old bodice fit wonky, I couldn't lace it up by myself like I planned. I was hesitant about using a pattern from one of the big commercial pattern companies because I didn't want my dress to look extactly like everyone else at the show. (I was like that as a kid, why stop now?) But some of the unhistorical liberties (for purists) these patterns take makes them fit much better the first time out unlike some of my current pattern stash. 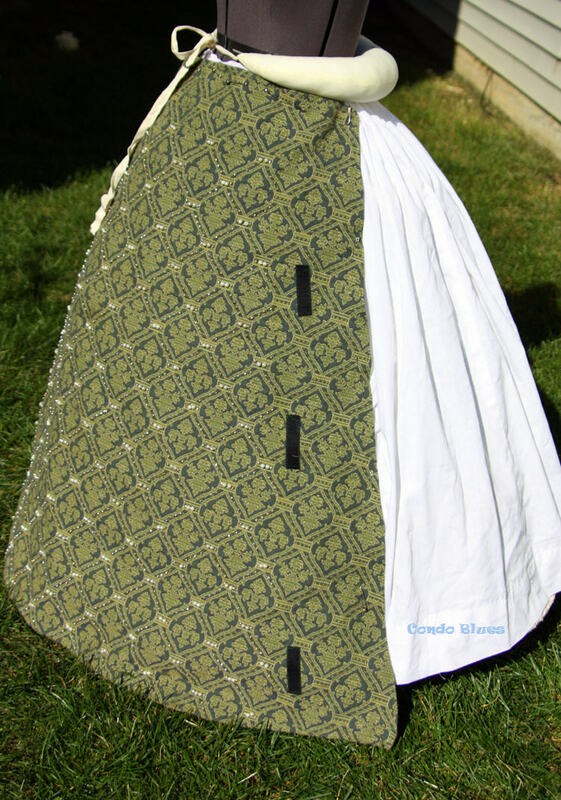 I made several test muslins and after a few nit picky historical tweaks, I squared the neck on Butterick Sewing Pattern 6196 to make it front closing bodice. 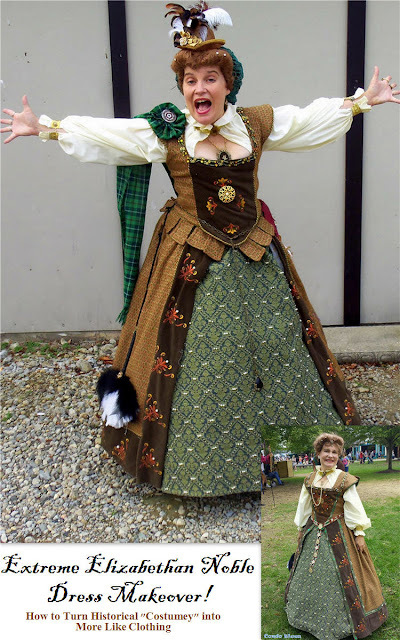 I added solid sleeve caps, piccalillis, and detachable embroidered sleeves for cold weather using pieces from my Medieval and Renaissance Dashing Doublets Pattern. 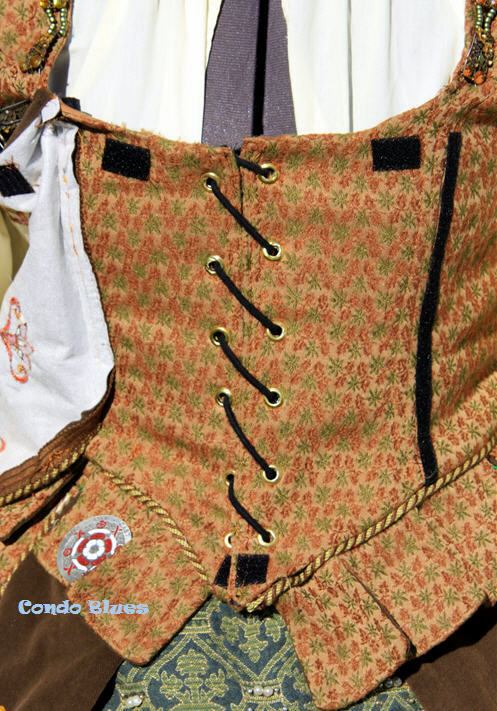 Spiral lacing is period and also helps make it fit snug like it should. The stomacher (brown insert) looks stuck on in a bad way. The embroidery on it is a little too large for my small frame. 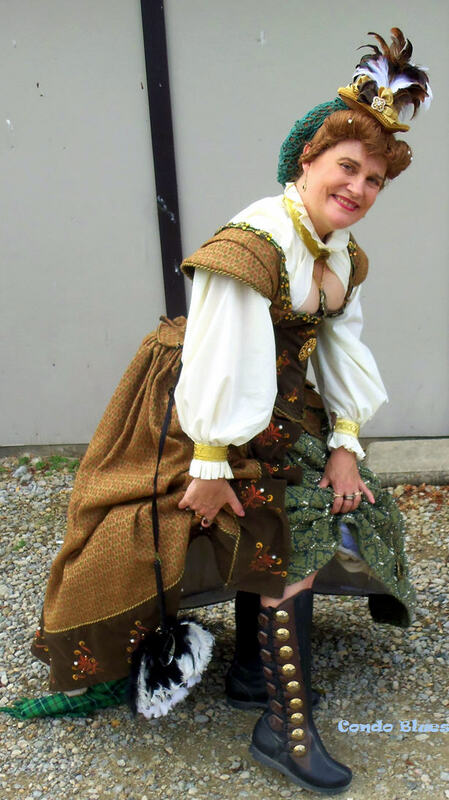 I used the bodice back pattern piece of Simplicity Pattern 3782 Elizabethan Costume Dresses to make an attached embroidered stomacher that “pins” over the front lacing per early Tudor design. A noble woman could wear up to 1000 pins to keep her various clothing pieces on compared to a working woman who may wear up to 4. I used ye olde hook and loop to stand in for period straight pins even though my history nerd self feels cringy using hook and loop for practicality. In other words, please don’t yell at me histroical purists. You probably don’t have to do a dive roll in your dress like I do. The pearl and metal beads around the collar where a swing and a miss. It is too too wide and while the pearls are period, the color doesn’t go with the metal beads or the dress. I restrung and shorted the metal collar beads with green glass beads that better match the dress and help with my goal of bringing out more of the green in the fabric. 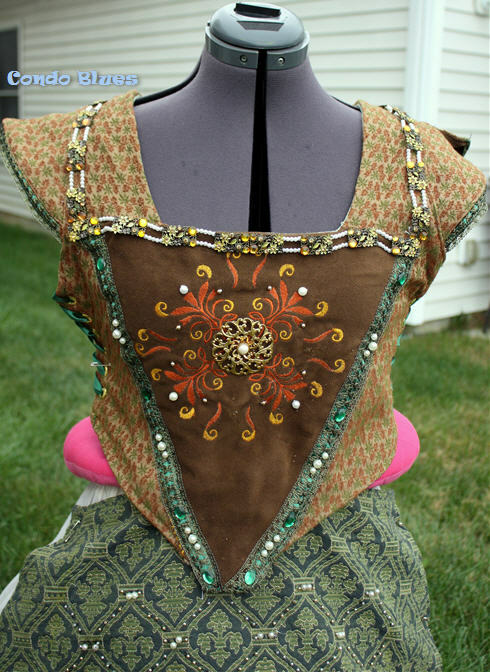 This is what the bodice looks like with the stomacher 'pinned" in place. I used a smaller built in embroidery design in my embroidery and sewing machine . I think it works better with my small frame. The girdle (belt) is too shiny, too wide1 and screams “I made this from modern clearance costume jewelry!” – because I did. I broke the original girdle the first day I wore the dress. You can read part one of this costume horror show on Condo Blues here. After a surprisingly difficult search for the size and length I needed, I bought three lengths of brass necklace chain and used my jewelry making tools to attach them to one another with the original black stone pendant at the end. 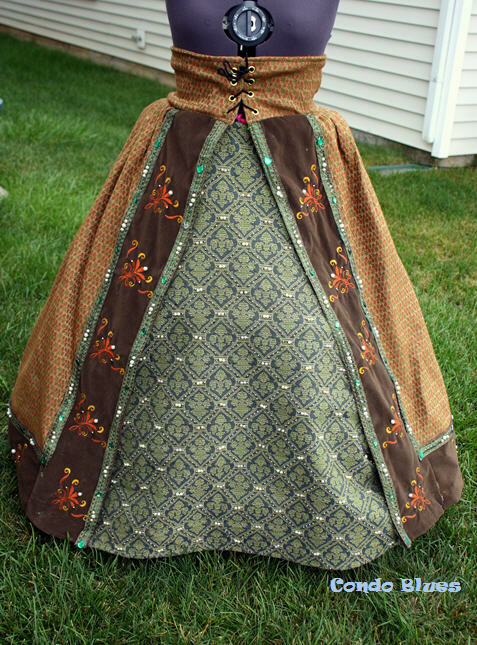 I added a leaf toggle close to the front to coordinate with the leaves in the fabric of my dress. I used Gem Tack to attach a metal filigree connector to the jewelry pin back I used as an emergency repair when I realized it is an easy way to attach my feather fan to my girdle. I can also use it to discreetly pin the belt to my dress to keep it from spinning around my waist when I’m dancing. I need a hat and to restyle my wig. The front looks more like 1940’s Victory Rolls. The glass pumpkin necklace is to tie into a theme weekend. Photo courtesy of Don Messersmith. Thank you Don! 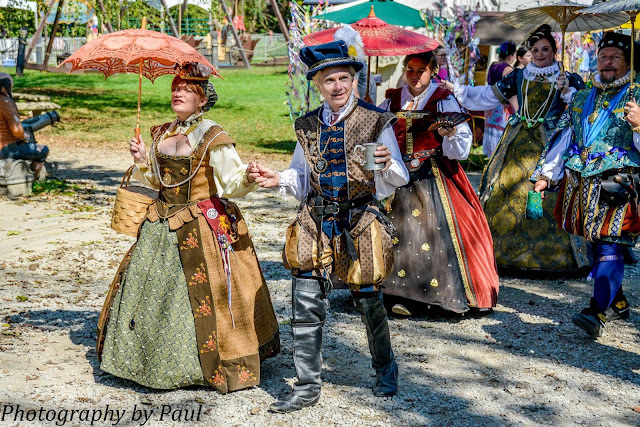 I sadly swapped my Gilded Lily Battenberg lace parasol for a more period paper Chinese parasol after a patron gave me the business about it making me look like the Old West. I’m crossing my fingers the paper parasol lasts until I can find a canvas version. If you know where I can buy one please let me know in the comments below! My wonderful husband completed my ensemble with the most gorgeous handmade leather boots from Son of Sandler. unbeknownst to him, I was able to check buy a pair of custom made shoes off my Bucket List. The gravel paths kill my feet walking the gravel paths of the show because my boots need new soles and heels. I was trying to make do while I searched for a replacement shoe repair shop since my favorite closed. The Son of Sandler manager heard me talking about my issue and said he might have something that fits my wee size four feet. I went in expecting to be disappointed which always happens when I don’t shop in the childreen's shoe department and was chuffed he worked with me to find a pair of grown up shoes that fit! They are so comfortable! 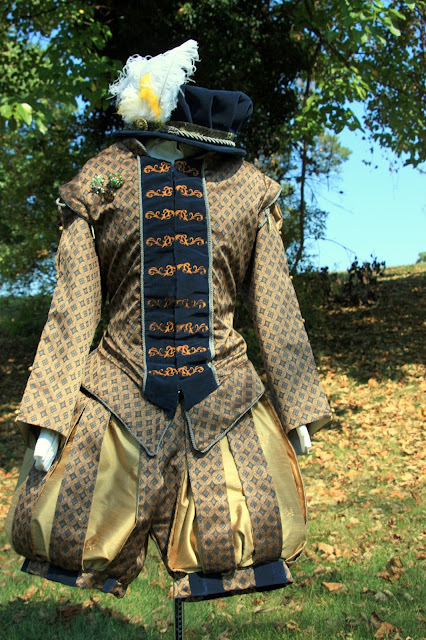 And without much further ado, here is the new Elizabethan Diva Dress! I am wearing a Scottish plaid in this photo because it was taken on Highland Games weekend. It is my family's tartan. It is amazing how much difference in my attitude and performance a well fitting dress makes! As vain as it sounds, I think I’m giving better performances because I’m not thinking about all of the things that are wrong with what I’m wearing. My husband and I with the village parading about the shire. Photo used with permission and by Photography by Paul. Thank you Paul! The dress and underpinnings weigh 30 pounds, which is fairly lightweight considering the entire outfit is made from upholstery fabric. It takes me about an hour to get dress from start to finish. I get as dressed as I can at home (boots, wig, and underpinnings,) do my makeup in the car as my husband drives, and put the hoop and top layers on when I arrive. Pin this post and share it with your friends!